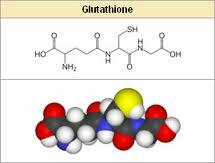 Reduced L-Glutathione, or GSH, is a tri-peptide made in every living creature, and it is made from three amino acids: glutamine, glycine, and cysteine. The average adult male human synthesizes 10 grams of GSH in his body per day. GSH is the body's primary water-soluble antioxidant, but arguably the function its redox ratio (GSH:GSSG) plays in the body as a modulator of the immune and inflammatory systems, is just as great. GSH also cleaves disulfide bonds in mucus, giving it a mucolytic quality as well. GSH bathes the extracellular space of sensitive tissues that come in contact with the oxygen in the air, and this includes the eye, the lungs, and the gastro-intestinal system, among others. The epithelial cells of these body systems efflux GSH into the extracellular space to protect them from oxidant damage. Unfortunately, in most of the systems just described, the epithelial channel used to efflux GSH is the CFTR. This means that those with CFTR mutations also efflux much less GSH. For example, in the lung the redox ratio should be well over 9:1, but in the CF lung, the ratio may be as low as 1:1. What happens to the CF lung and GI systems when this GSH system dysfunction occurs? The results are many and devastating. The purpose of this page is to provide a series of resources that explain GSH system dysfunction in CF, and offer a treatment protocol pioneered by Dr. Clark Bishop,. M.D. (clark.bishop29@gmail.com ), to address that dysfunction. Treatment of CF with GSH is by no means a cure, and does not obviate the need for additional therapies, but there is promising empirical evidence that such treatment can be effective in ameliorating some of the pathophysiologic mechanisms of CF. Please read the disclaimer on our homepage: the UVICF does not condone adding or removing therapies from your prescribed regimen without the support of your medical professionals. Cysteine donors--products that provide cysteine--are becoming very popular. There are even several multi-level marketing firms that advertise products meant to "boost" levels of GSH in the human body. The most inexpensive cysteine donor is a substance called NAC, or n-acetyl cysteine, which can be obtained without prescription in any health food store. It donates cysteine just as effectively as more expensive donors. While it is certainly important to use cysteine donors in CF, since the amount of GSH the human body can make is limited by the amount of cysteine to which it has access, remember that cysteine donors will not overcome the CFTR efflux problem for CF persons. That is why Dr. Bishop recommends the use of GSH itself in CF, even when cysteine donors are used. The UVICF has worked with a company called Theranaturals, helping them to understand the type of GSH product that CF persons would find most useful. The UVICF has no financial connection to Theranaturals, and neither does any member of the Institute's board of directors. This recommendation is given solely on the basis of the quality of the product, the form of the product, the price of the product, and the customer service of the company Theranaturals.